Use of Direct Exchange Connectivity to ensure low latency feeds. Clients can use the same Login id to access their account on multiple devices (one at a time though). Data is provided for multiple timeframes. Subscription for TrueData starts at 990 INR per month. Check out the different plans here. 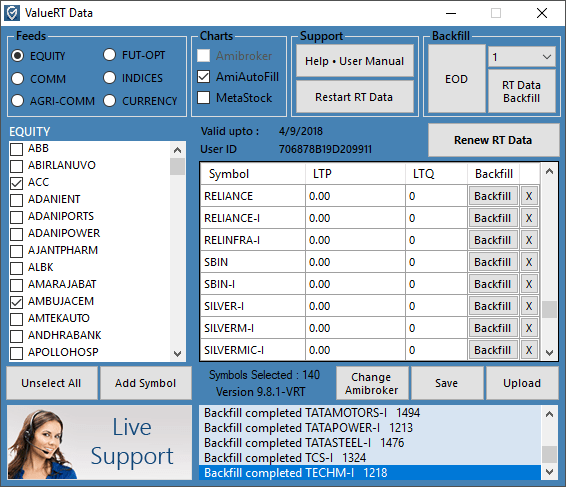 Real Time Data Services available for Live Futures Data, Metastock Data, Commodity Real time Data, Equity Intraday Data, Live Data for Amibroker and Data Feed for Metastock. Use of multiple dedicated servers to update Metastock and Amibroker and to ensure uninterrupted data flow. Subscription starts at 500 INR per month and they offer bulk discount if your purchase multiple products. See the entire plan here. The company employs sophisticated and reliable techniques for delivering direct exchange datafeeds integrated with advanced Charting and popular international Technical Analysis platforms including Ensign, AmiBroker, MetaStock Professional, Elwave, Bulls Eye Broker, NinjaTrader and Advanced Get. GDFL focuses on delivering accurate and authentic live stock market data at cost effective rates. The company distributes realtime, low latency data of Currency Derivatives (NSE CDS), MCX, NSE CM (Cash), through their products namely- nimbledataProPlus(TM), nimbledataPlusLite(TM) and nimbledataPro(TM). Subscription starts at 1735 INR per month. This is relatively expensive but it is worth owing to reliability and accuracy of their service. All these 3 data providers are definitely good and reputed. But if you want to select one of these, the best way is to avail free trials and chose the one which is most suited for your requirements. If you are looking for a cheap and quick solution ValueRT or TrueData is best for you. But if you are dealing with complicated quant strategies or high frequency trading, you should go for GDFL . If you come across any other data providers which you feel deserves a spot on this list, let us know, we would be happy to publish your review. Thanks for the info on data providers. I have subscribed to NADF Pro of Tradermate. It works only with NEST 3.13 and 3.11 versions. It is the cheapest and the best if one has the above mentioned NEST versions.